This is a question we have been asked often over the last 22 years of vacationing on this beautiful island. Once you have experienced the magic of this enchanting caribbean island yourself, you will have discovered the answer. This is the best of all caribbean island vacations! Over the years we have thoroughly explored this island and have collected many invaluable travel tips and what we like to call "Pearls of Wisdom" on how to navigate around the island to get the most out of your vacation or holiday. We used to give this information in the form of a small packet to our closest friends and relatives to whom we have recommended this caribbean island as the perfect vacation spot. They loved it! But over the years the packet grew so big that we decided to create a website to help as many people as possible to get the most out of their experience on the island. We hope you find this website just as useful. 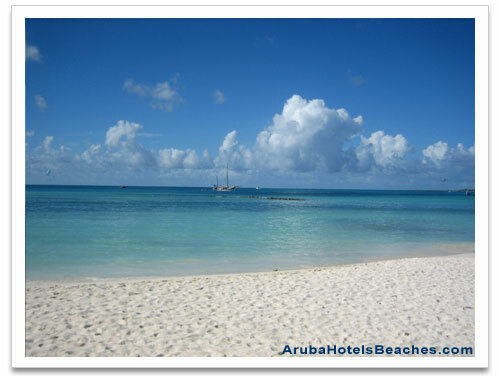 Aruba Weather - wonderful warm weather all year long! Location is outside the hurricane belt! We don't have to worry about being directly hit by a hurricane since the island is just south of the hurricane belt. Tradewinds - We can lay out in the hot tropical sun and be pleasantly cooled off by constant tradewinds. Love It! Watch out for flying hats! Hold on to anything that is light enough to be blown away, including your half empty drink. It's no wonder why this island has the highest visitor return rate in the caribbean. Whether you are on your caribbean island honeymoon, or looking for a quiet, relaxing, "do nothing" kind of vacation, or an adventurous fun loving, bar hopping, "get out and explore" kind of experience... This island has it all! The friendly local people will welcome you to their island with a genuine smile and a warm greeting. They are dedicated to making your stay an unforgettable one. In our opinion Aruba is truly paradise. This tropical island has an intoxicating blend of experiences for all to enjoy!